… without dogs and cats. 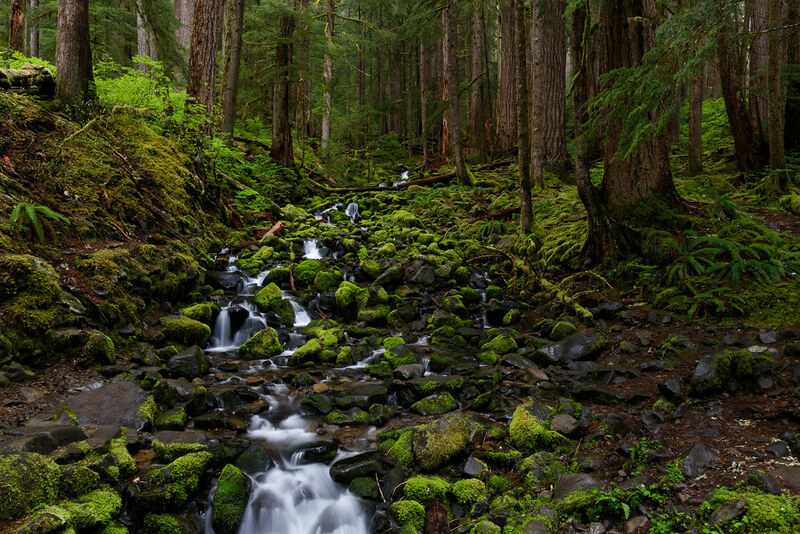 Taken on a dark rainy afternoon on the Sol Duc Falls Trail in Olympic National Park. 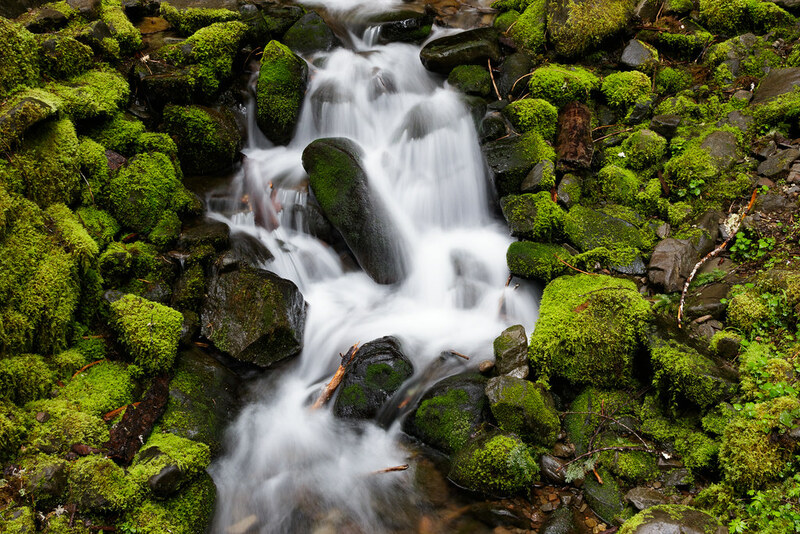 On the way to Sol Duc Falls, you pass over this stream falling down the hillside towards the Sol Duc River, the surrounding rocks covered in the most beautiful moss. 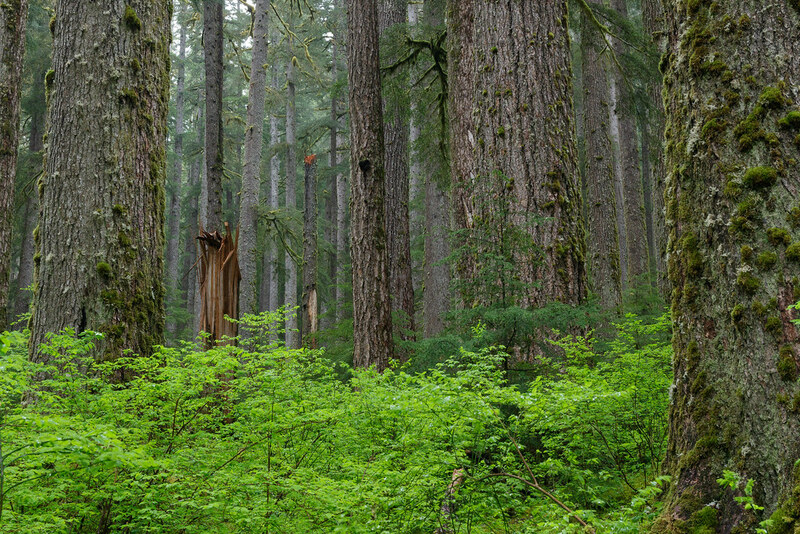 It rained the entire way on the short hike down to Sol Duc Falls, not surprising since I deliberately planned this trip around rainy weather. I was looking forward to seeing the falls, having visited them a few times before, but my heart sank on the approach. The bridge. I always forget about the bridge. 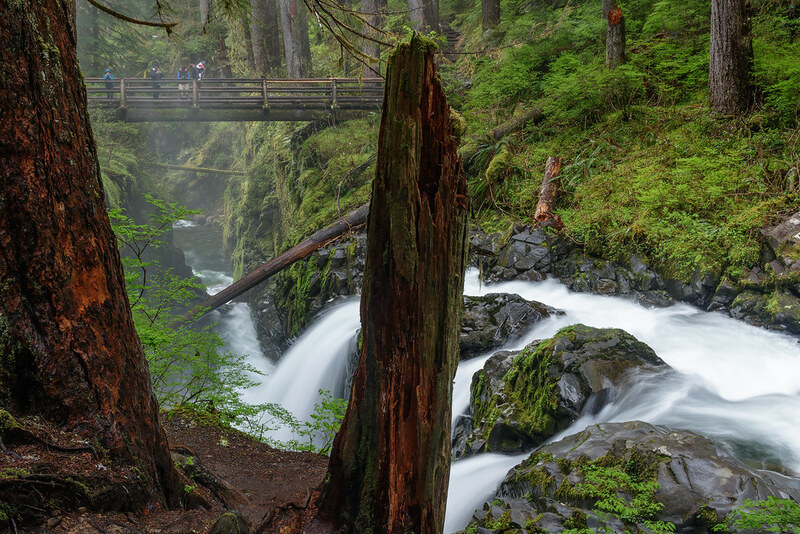 I love the bridge itself, sturdy and wooden and water-soaked like the enveloping forest. The problem is the deep and narrow chasm that lies below as I’m rather scared of heights. Add the deafening roar of the falls and it overwhelms my senses. I screwed up my courage and walked across without looking down and started taking pictures of the falls from the other side, a little out of sorts and finding it hard to concentrate. A large family was there already (or arrived shortly thereafter, the visit is a bit of a blur in my memory). You can see a few of them on the bridge at the top of the picture, unwitting models that provide a sense of scale. They were lovely folks and helped me relax a little bit. When I decided to head back to the car, I gathered my courage once more and made a beeline across the bridge. The family had all gathered on the bridge for a picture and as I passed asked if I’d mind taking a picture of their group. I froze in place and couldn’t say anything. I think they thought they might have offended me with their innocuous request so I quickly stammered that I’d be happy to take their picture but I had to get off the bridge. Once on the other side they handed me their camera, a Nikon unfortunately as I shoot Canon and the controls are similar yet different and I had been struggling to shoot even with a camera familiar to me. Hopefully the picture came out well enough, looking at the result on the camera at least you could tell they were having a good time. I hope they were happy with it because they made my visit more enjoyable and now I can smile when I look at this picture and think about the bridge, at least until the next time I have to cross it. 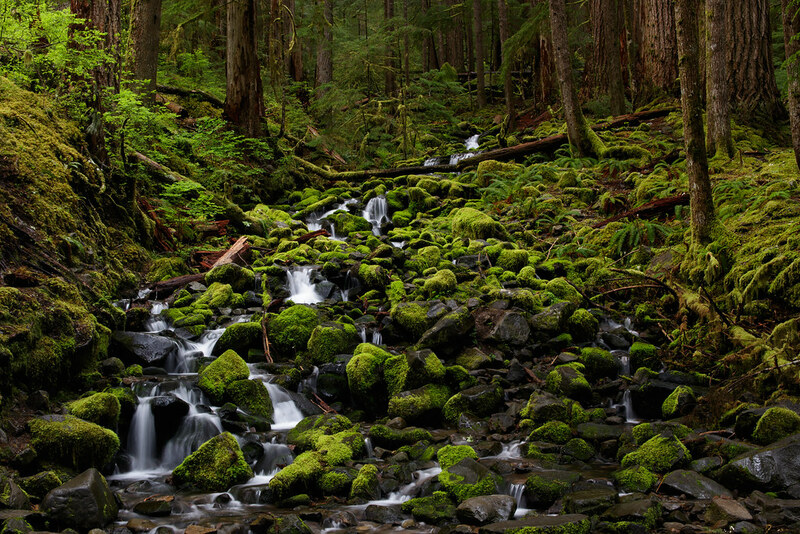 A stream flowing to the Sol Duc River reveals the four elements of the Pacific Northwest: earth, air, water, and moss.